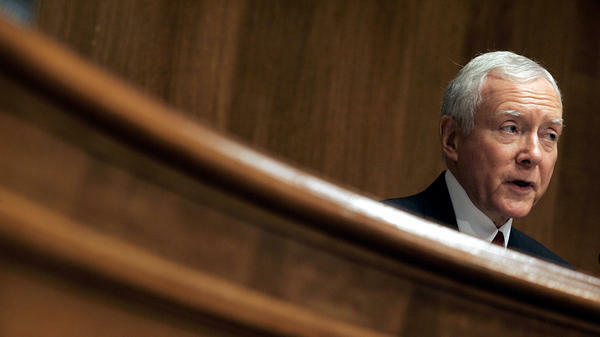 Sen. Orrin Hatch, photographed during a Senate hearing on music licensing reform on July 12, 2005. Hatch — a songwriter with both a platinum and gold record for his efforts — had his name added to the title of the Music Modernization Act, which passed the Senate unanimously on Sep. 18, 2018. "It is the most important piece of legislation in a generation to help make sure songwriters in our country are paid and are paid a fair market value for their work," Tennessee Senator Lamar Alexander asserted on the floor of Congress following the bill's passage. The bill is essentially a music business peace treaty, designed to fix some very longstanding issues within it. It's the result of years of slow-moving compromise between tech companies like Spotify that rely on music (and wish to pay as little as possible for the privilege), entrenched music industry interests from major and independent labels to publishers and performance rights organizations, artists (who wish to get paid as much as possible from companies like Spotify) and the organizations that advocate for them. For years, these largely at-odds entities have sparred over the tortuous system currently in place for the licensing of music, both songwriters' compositions— which are legally distinct from recordings and governed by rules established prior to World War I — as well as the money paid to songwriters for those licenses. Spotify, when it launched in 2011, did so without having an effective way to identify and pay songwriters for the millions of recordings of those compositions it was making available to its customers. And in the years since, as Spotify has grown into one of the world's most-valuable music companies, it has been sued for it many times. The introduction of the Music Modernization Act, this past December, actually accelerated the filing of a $1.6 billion lawsuit against Spotify over this problem, since that would cease to be an option after the first of this year, once the bill becomes law. The compromise at the heart of the bill (which will now return to the House for approval of Senate amendments before making its way to the White House) is to provide a legal shield for companies like Spotify from these lawsuits and the large settlements that have accompanied them. Obviously the music industry has, along with everything else, evolved greatly in the century since these rules were established, but never has it changed as quickly as it has over the past decade or two. The Music Modernization Act is an attempt to repair the fissures created as the digital revolution bloomed, and to balance the interests of artists and the tech giants who need them. To do so, it will establish a new quasi-governmental organization called the Mechanical Licensing Collective — at the expense of the digital music providers who will use it most — that will create and operate a comprehensive, public database containing all relevant information on songwriters' work, which tech companies will then use to (finally) pay songwriters properly. The bill also addresses the rates songwriters are actually paid for their work, which is... not a lot, as Sen. Alexander learned after contributing to the writing of a song with Nashville professionals. "A few years ago, I was in my hometown of Maryville, Tenn.," he told the Senate, "I went into the drugstore, and as I was coming out, there was this older couple who was sitting in a pickup truck. I asked: How are y'all doing? The woman in the pickup truck said: 'We are just falling apart together.' It just so happened that over that weekend, my son, who is in the music business, had a group of songwriters at our home, and they were writing songs." After mentioning the story to his son, a song — "Falling Apart Together," from the country artist Lee Brice — was made from it. Money, however, was not, despite it having been played on Spotify alone over a million times to date. "According to Nashville's custom," Alexander continued, "I get a one-fourth royalty for the song whenever the song is played ... In 2016, I reported on my ethics form, which I file each year, that my royalties only added up to $101.75. That was for one-fourth of a record that was played on an album of a pretty well-known singer and writer." Other than the Mechanical Licensing Collective, the new bill addresses some other longstanding points of contention. The somewhat shadowy Copyright Royalty Board — a panel of three judges responsible for setting some royalty rates, mostly related to radio-like services such as Pandora, where listeners can't pick from any song they'd like to hear — is now allowed to consider a song's value on the open market, what's called a "willing buyer, willing seller" provision, which should eventually mean more money for songwriters. In addition, performance rights organizations such as ASCAP and BMI will now be able to argue their cases in front of a rotating cast of judges in the Southern District of New York, instead of having to repeat their case endlessly in front of the same two, as they have been for some time. The system will remain punishingly baroque, but the changes should also result in increased pay for songwriters down the line. Despite the congressional unanimity it was met with, and the compromises required from all corners of the music industry to even introduce it, the Music Modernization Act didn't sail smoothly to yesterday's passage. Just two days ago, a group of 150 artists, from Paul McCartney to Sia, issued a letter rebuking SiriusXM for attempting to derail the bill, as they saw it, over a provision that would close a loophole in the law over royalties of songs recorded before 1972. And earlier this year, the private equity firm Blackstone enlisted Sen. Ted Cruz of Texas to try and introduce language protecting a subsidiary company from competitive danger. "It was a very complicated exercise," Sen. Alexander explained on the Senate floor, "and it was in doubt until about an hour-and-a-half ago in terms of whether we would be able to do this tonight." If the amended version of the bill passes the House, it will then go to the desk of President Donald Trump to be signed into law. Assuming there aren't any complications in that process, everyone involved, who spent all those years across the table from each other hammering out this significant compromise, can return to war. Just with new weapons.